There’s an old saying in many Twelve Step fellowships that goes “a grateful alcoholic will never drink” or “a grateful addict will never use”. While clearly scientifically impossible to prove and surely not “evidence-based”, this theory seems to hold some weight in relation to the importance of gratitude in recovery. Gratitude, defined as “the quality or feeling of being grateful or thankful” or “acknowledgement of a benefit that an individual has received”, is an important quality for happiness, contentment and a healthy emotional view of self and of the world. Qualities that often are absent for the addict or alcohol still in active addiction. Gratitude does not depend on what a person has or the material possessions they own. Both rich and poor can be grateful. Gratitude is an attitude, a positive outlook towards life. Gratitude is humbling. Having gratitude allows someone to more clearly see the truth of their situation. Gratitude allows for constructive, unselfish behavior. This type of positive thinking and outlook can then influence the behaviors of an individual, which can aid in leading a sustainable recovery-oriented life. When a person is suffering from substance abuse or addiction, typically they do not go about their day with a positive outlook of gratitude. Addiction is defined by self-centeredness, victimization and depression. Addicts in active addiction are never satisfied, always want more, are dissatisfied with their life, how others act, what others do and how they feel life is treating them. Often they live in constant fear about numerous issues, they feel they’ve been given a poor lot in life and they cry out in anger about why they have been forsaken. Entering into recovery, addicts and alcoholics are directed to a healthier and more positive outlook. Through good quality, comprehensive treatment and often direction through spiritual action, these people change their thinking and their actions to cultivate a more grateful outlook towards their lives. This positive outlook is something that is important to be sustained long term in order for someone in recovery to continue their journey or healing and growth in order to stay clean and sober. 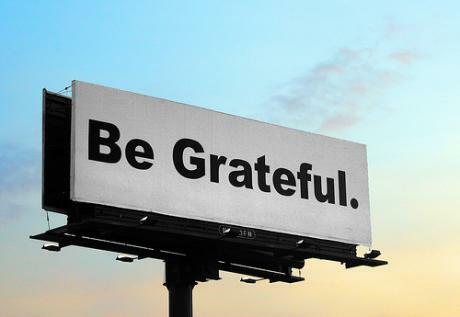 Another way to look at gratitude is from an opposite perspective, that people are unhappy because they want the things they do not have while failing to recognize all that they do have. This type of perspective will cultivate unhealthy attitudes towards life, towards relationships, towards jobs, towards everything. It leads to comparing our life to someone else’s that we perceive to have “better” or “more” of what we do not have, and that in turn leads to frustration and anger and resentment. Twelve Step fellowships caution to always be aware of resentments for they are the root causes of most relapses back into active addiction. Instead, those addicts and alcoholics entering into recovery from an addiction treatment center will learn the importance of changing how they perceive the world, creating healthier outlooks and better attitudes towards life. Being grateful to be clean and sober is motivation for someone in addiction recovery to continue staying clean and sober and thus will continue taking the actions they need to do ensure their sobriety. Being grateful allows an outlook that changes difficulty into opportunity and problems into challenges. Gratitude brings about a healthy outlook than anything can be accomplished and problems and difficulties in life can be faced with grace and dignity and faith. Gratitude allows for humility and truth and hope, key essentials for anyone looking to recover from drug or alcohol addiction. Do you know someone struggling with drug addiction?